Professors in the Honors Program Drs. Jonathan Thorndike and Mary Ellen Pethel recently presented at the “Teaching the Christian Intellectual Tradition” conference at Samford University in Birmingham, Alabama. The conference centered around pedagogical approaches to theology and changes in culture during the era of the Reformations in European history. 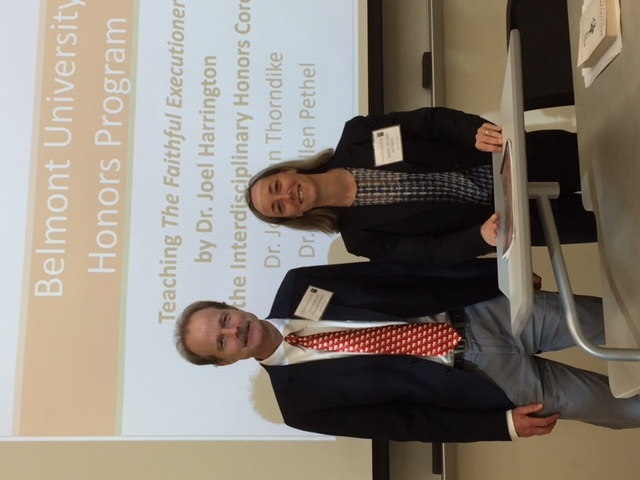 Pethel and Thorndike’s presentation focused on the way the Honors Program teaches a course on the Reformations by use of the book “The Faithful Executioner,” written by Joel Harrington. The book follows the thoughts of the official executioner for the city of Nuremburg, Germany in the late 1500s based on a journal he kept that detailed the people he executed and interrogated. Harrington, Chair of the Department of History at Vanderbilt University, stumbled upon the journal while he was on sabbatical in Germany and used the text to create an analysis of the concepts of honor and shame surrounding executioners. Thorndike and Pethel use the text to illustrate political and religious power, individual sovereignty, responses to ostracism, confession, forgiveness and redemption through God’s grace by assigning reading and writing exercises with these themes in mind. The featured plenary speakers for the conference included Theologian at Saint Anselm College Dr. R. Ward Holder and Associate Dean of Academic Programs and Professor at Duke Divinity School Dr. Sujin Pak. The conference was hosted by Samford University’s Core Texts and University Fellows Honors Program. It was designed to bring together scholars from a wide array of disciplines to encourage idea sharing in regards to teaching the rich intellectual heritage of Christianity to today’s undergraduates.